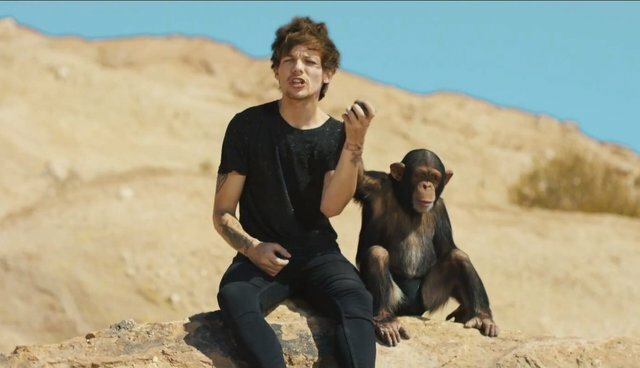 The music video for "Steal My Girl," which dropped in late October courtesy of tattooed muppet troubadours One Direction, features Danny DeVito as well as a smaller, charming ape: a young chimpanzee. In response, primate welfare group Wild Futures pointed out the band's misdirected casting of a real chimpanzee. "We know that you would not deliberately abuse any animal, but believe that these situations arise because of a lack of understanding or knowledge of the reality for primate ‘actors,'" they write. "The use of wild animals in this way is a damaging and destructive practice that is condemned by zoologists, animal welfare scientists and conservationists worldwide." Delcianna Winders, an attorney for PETA, minced few words in a statement and alleged that the company that owns the chimpanzee is less animal-friendly than it appears: "One Direction's millions of fans would not want the band to contribute to a chimpanzee's suffering or let a notoriously abusive animal exhibitor make money from their new music video." As Jane Goodall told John Oliver in a recent interview, young chimpanzees may appear adorable, but raising them in human care is fraught with risk. "They're very cute and sweet and cuddly when they're little. And what happens when they're five, six, seven? And why do people have their face bitten off?" Considering Harry Styles has a "well shaped and proportioned face," let's agree to keep that out of the reach of endangered wild animals, yeah?